My left leg was still in pain when I woke up at around 3am today. But I had to wake up because Oval BA was up. Seeing was only average. 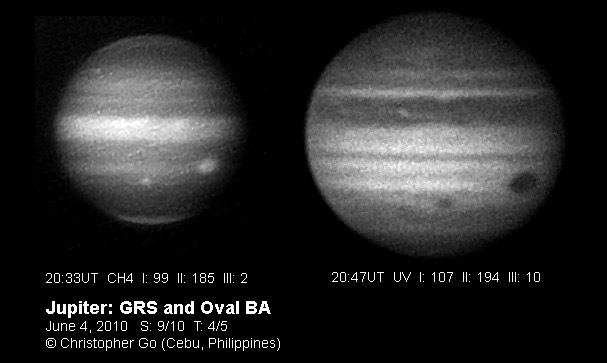 The GRS and Oval BA are setting on these images. The area following BA is very disturbed. note the bright area in Methane following BA. The SEB is very quiet. But the note the bright tiny flares on the SEBs. 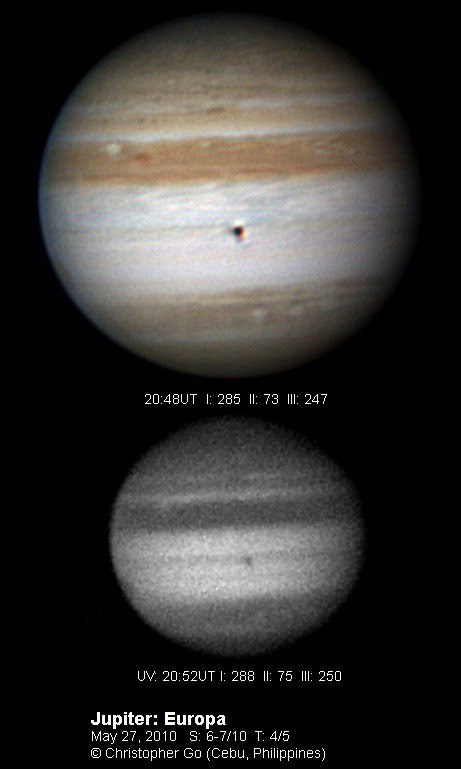 These were well resolved on the HST image earlier this month. The NEB is still very dark and busy. The NNTZ LRS is prominent on the northern hemisphere. It is very bright in Methane Band. I have been out of action for weeks because my filter wheel broke down. Thanks to Andy Homeyer for fixing it. My filter had to go back to New Mexico then back here in Cebu. My cousin Grace brought it back home! When the filter wheel arrived, my right foot got sprained so I was our for a few more days. Seeing was average this morning. 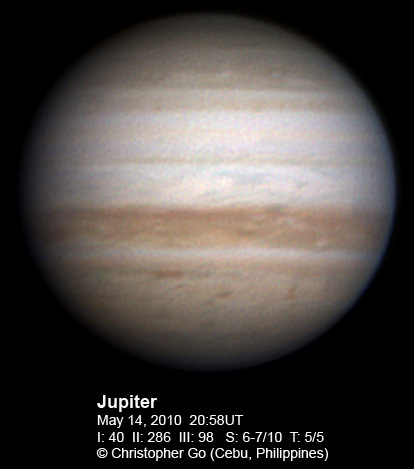 Jupiter was more than 70 deg when I took this image. The GRS is rising on the right. The SEB is still faded but note the orange band on the SEBn. The SEBs is a bit busy and looks like part of the EZ. The NEB is very busy with lots of ovals. 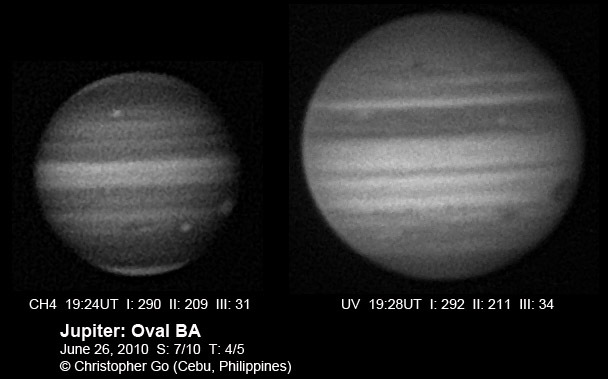 The GRS and Oval BA are prominent in these images. Oval BA's ring is very visibile. The white spot following BA has been pushed south. There seems to be a reddish feature north of this white spot. The STB remnant following BA is very prominent. The GRS looks very lonely at the SEB. The bluish feature of the EZ seems to have pushed into the SEB. The NEB is very busy and dark. Note the outbreak. The NNTZ LRS can be seen rising on the upper left. The GRS, Oval BA and the NNTZ LRS are all bright in Methane band and dark in UV. Today was suppose to be a routine imaging run. Seeing was perfect. 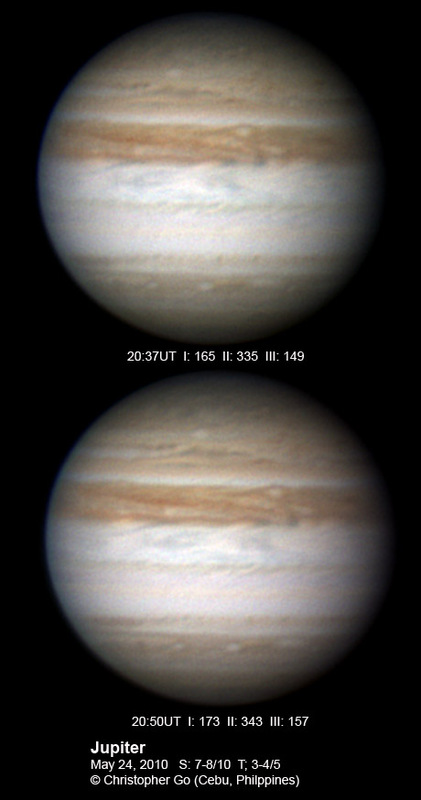 And this was on the boring side of Jupiter. 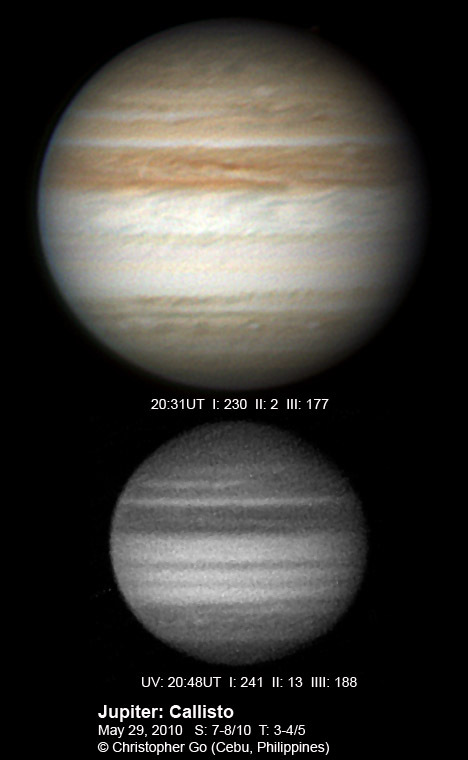 On my second image sequence using the blue filter, I luckily imaged an impact on Jupiter. I did not see this when it happened but Antony Wesley saw this in Australia. Anthony sent an alert on this suspected impact and I was able to confirm this with my video. The impact occurred at exactly 20:31.5UT (04:31.5 local time). The impact lasted for around 1 sec. This impact hit the now faded SEB! This is good timing as it will make it easier to find a dark remnant. In my image below, I have superimposed the impact frame to the color image. I would like congratulate my friend Anthony Wesley for having such a sharp eye on this historic find! Seeing was almost perfect this evening. 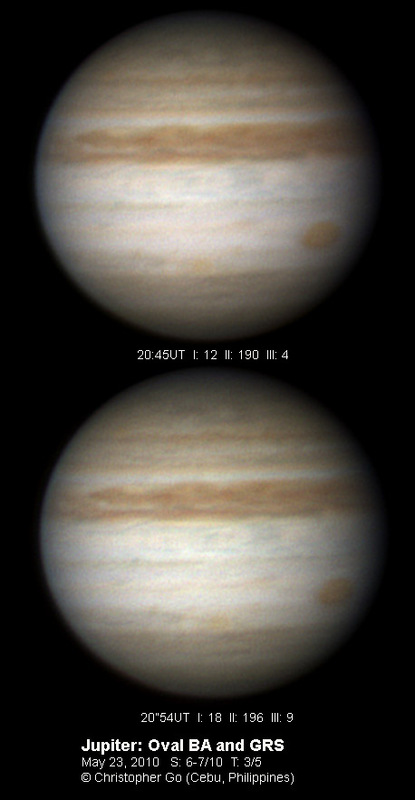 Jupiter as around 56 degrees when I took the last image. The GRS is the most prominent feature here. It's dark red core is resolved in these images. The south-southwest edge of the GRS is very dark. Note also the tiny red dot following the GRS. Although the SEB is very quiet, the area surrounding the GRS looks very busy. The red ring of Oval BA is well resolved. The little white oval is getting closer to Oval BA. Hopefully they will merge in the coming months unless a dark cyclonic oval will appear between the two again. The NEB is very dark with a lot of activity. The bands on the north temperate zone is also interesting. In UV light, the GRS and Oval BA are very dark. The asymmetry between the two hemispheres is very striking in UV. Seeing was good this morning but transparency was variable because of clouds and haze. While imaging a noticed a strange extension in the right of the NPR. This turned out to be the dark moon Callisto. You can see Callisto if you brighten your monitor. The SEB is very busy. The northern hemisphere is very red while the southern hemisphere is grey. The NEB is very busy with a lot of activity. The SEB is fairly quiet. The yellow bands on the SEBn and SEBs is dark in UV light. Seeing was variable this morning. But this is where the Flea3 really shines. Even with less than favorable seeing, because of it's sensitivity, I can still get decent images. The NEB is still very dark. Note the rifts on the NEB. 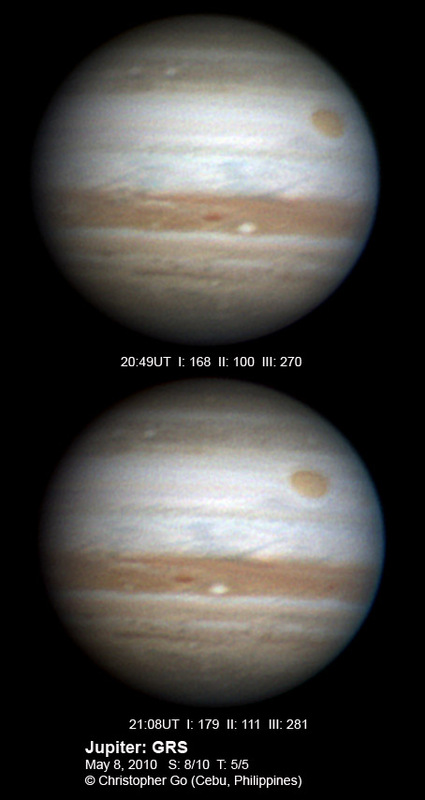 The red and white spot pair on the NEB are still there. 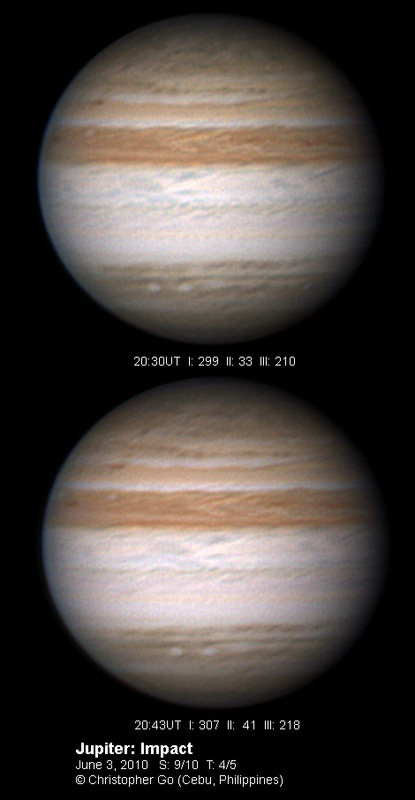 Europa's shadow is on the SEBn. Note the distorted shadow due to seeing. The SEB is still very zonal. 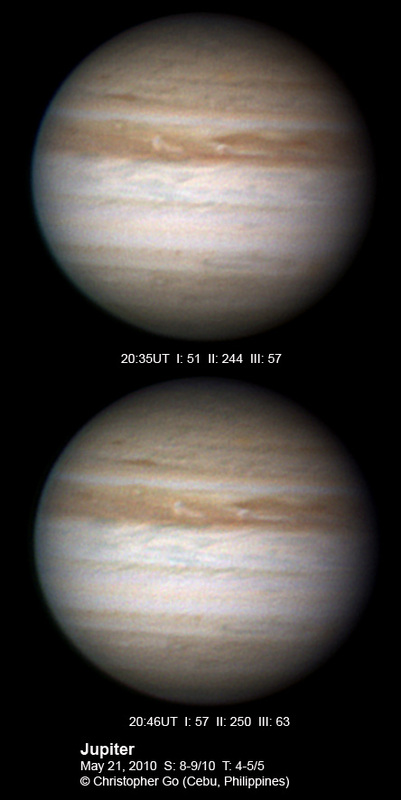 The GRS is rising on the bottom image on the right. There seems to be a white haze forming south of the SSTB. 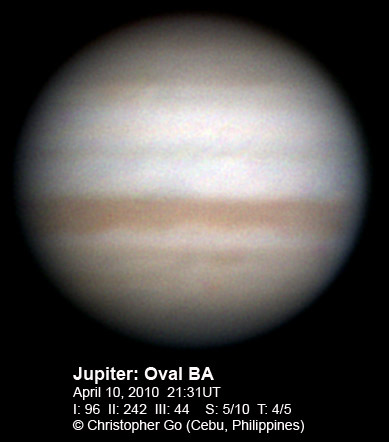 I was able to get a UV image of Jupiter. I am still working with PGR to provide support for longer exposures with the Flea3 so I can take Methane band images. 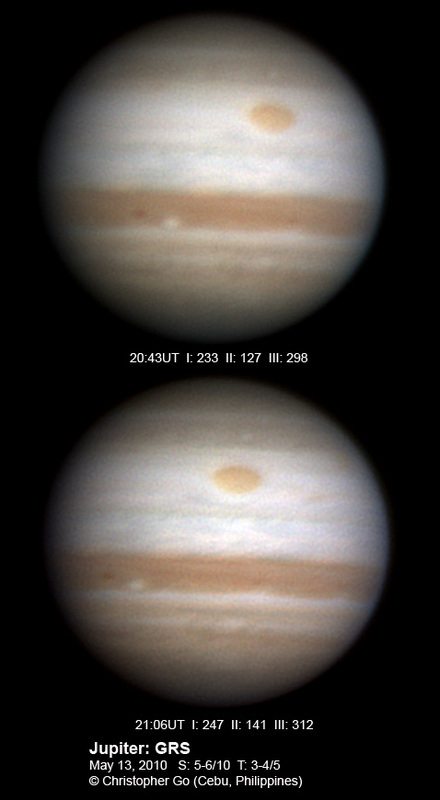 Seeing was good this morning but transparency was variable because of thin clouds. The SEB is still very quiet. Note the bluish festoons on the EZ extending towards the SEB!! Note the orange streak on the SSTB between the two ovals. The EZ looks very busy with a lot of interaction with the NEBs. The northern hemisphere looks very busy. Seeing was very variable this morning. I'm still trying to get a handle with the Flea3. Oval BA is very prominent in this image. It is not as dark now. Note the white spot that is moving closer to BA!!! The dark cyclonic spot that prevented the two from merging is no longer there! Will the merge now? 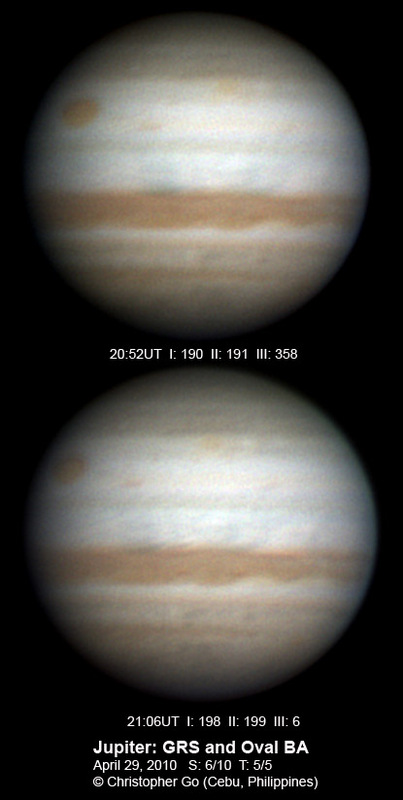 I would like to ask Jupiter imagers to keep track of these two storms as them might merge any day now!! The SEB is very light. The GRS looks very lonely! The NEB is very dark. Note the rifts on the NEB! A belt seems to forming on the NNTB! The LRS seems to be embedded in this belt. Seeing was excellent this morning. I have finally upgraded to the Flea3 camera!! This camera is amazing and the image to the right says everything! It is much more sensitive than the DMK and allows 12bit capture. If you want to see the difference between 8 and 12 bit check out the image today against yesterday's image!! The noise is also lower because I am able to capture at faster frame rates and lower gain! From the image on the left one can see that the northern hemisphere is very red compared to the south! The SEB has very zonal color. It looks like the EZ has pushed to the SEB! The NEB is very busy while the NNTZ LRS can be seen above as an orange spot! I would like to thank Torsten Edelmann for making the wonderful Firecapture software!! I would also like to thank Darren Neuhaus of Point Grey Research for taking care of my Flea3!! So from this day on, I officially retire my DMK. I have had some offers for this camera. Sorry this cam is NOT for sale. It's was the cam I used to discover Red Spot Jr... So it does have some sentimental value! Seeing was good this morning. 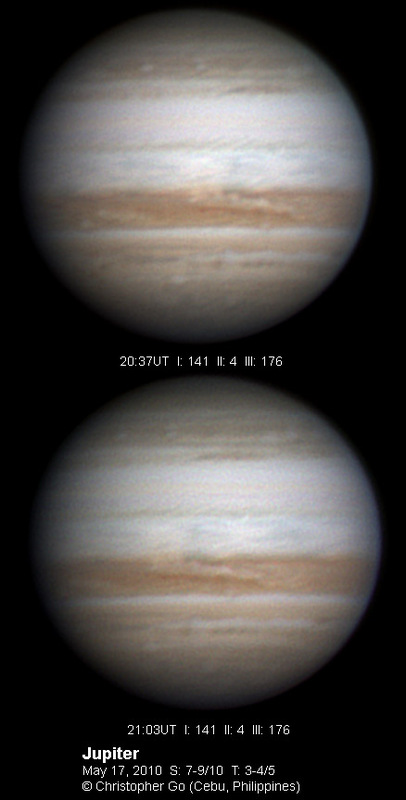 The GRS is rising on the right while Europa is the dark spot on the SEB. The NEB is very busy. Note the dark and white oval forming a ying-yang pattern! There are a lot of details in the northern temperate region. Seeing was again excellent this morning. The SEB is very quiet. The SEBs has a light orange color. The mid-SEB has an almost Zonal color like the EZ. While the SEBn is dark. There seems to be an oval on the mid-SEB at the CM of the top image. THe NEB is very busy! Note the dark red oval on the mid-NEB just past the CM. There are also some white ovals and rifts. The EZ looks actively lately with Festoons appearing. Finally had very good seeing this morning. The SEB is very pale. Note that the mid-SEB is a bit bluish. Note the white ovals on the SSTB. There are two white ovals on top of each other. There is a huge rift in the NEB. Something seems to be stirring up this region. The NEB is still very dark. Seeing was okay this morning. 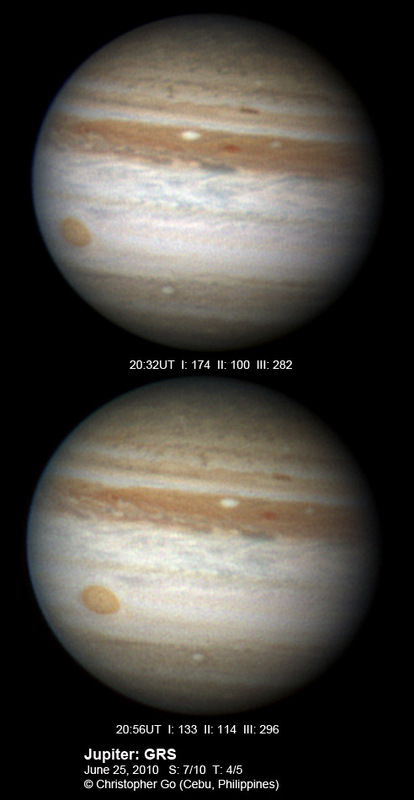 Jupiter is finally above 40 deg! The SEB is very pale! One can see the GRS peeking on the image below. The NEB is very busy with complex rifts. 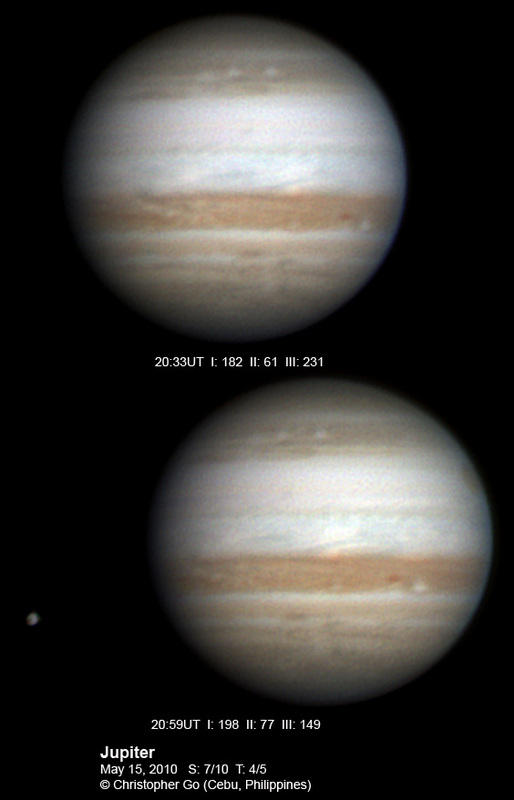 Ganymede is on the left. I had just emerged from Jupiter's shadow. Seeing was a little better this morning. But I'm still having problems with my filter wheel. The SEB is really quiet! There are still some light coloring at the southern edge of the SEB. The EZ is turning yellow and activity seem to be picking up. The NEB is very dark. 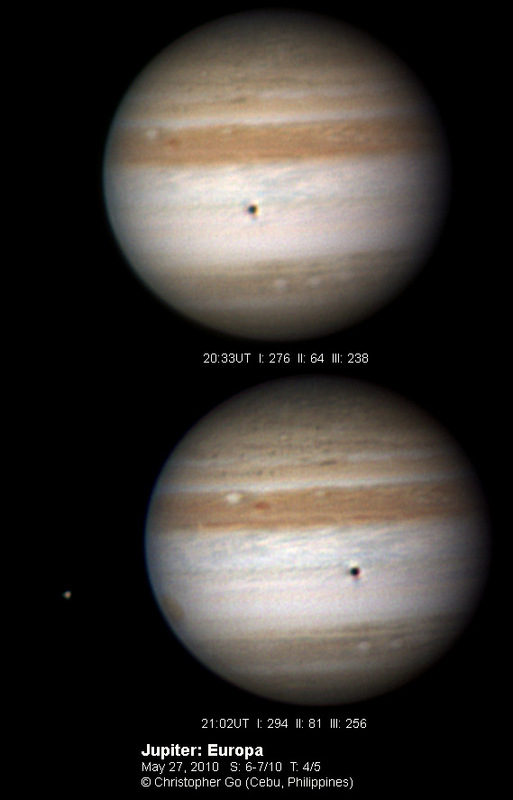 Note the dark red spot close to the CM. Note the dark red barges on the NTBn. Seeing was again poor this morning. Clouds were coming and going making imaging a bit frustrating. 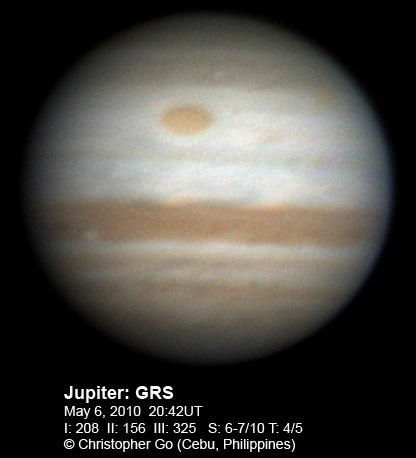 The GRS can be seen in this image. It is very prominent! The NEB is still very broad and dark. The contrast between both hemispheres is obvious. The north is very red while the south is light! Seeing was poor this morning. My filter wheel went crazy. It refused to change position and the motor sounded as if it was stuck. I later found out that, thank God, it was only the power adapter that was busted. Nothing much to see here except that the SEB is basically gone. The NEB is very dark with some outbreak activity past the CM. Seeing was not good this morning. 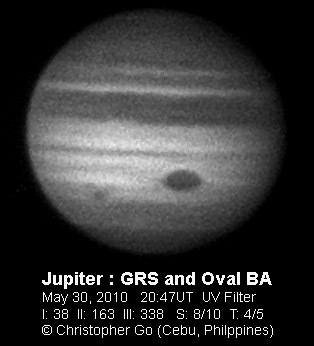 The GRS and Oval BA can be seen in this image. Note the white spot following Oval BA. It seems to be getting closer to BA again!! The NEB is very dark. Note the two red ovals in the NEB around the CM!! Are these cyclonic ovals? 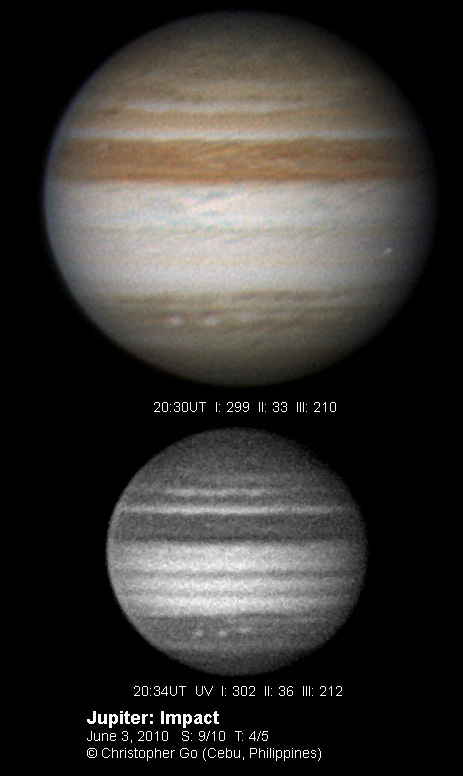 Methane band images show these spots are dark. The NNTZ LRS can be seen rising on the right. I had a crazy situation this morning. My filter wheel went crazy. I thought one of the filters got loose. I had to take it apart but all filters were tight. It was the power adapter that was loose! The SEB is very light in this region. Note the blue feature of the EZ seem to extend into the SEB! 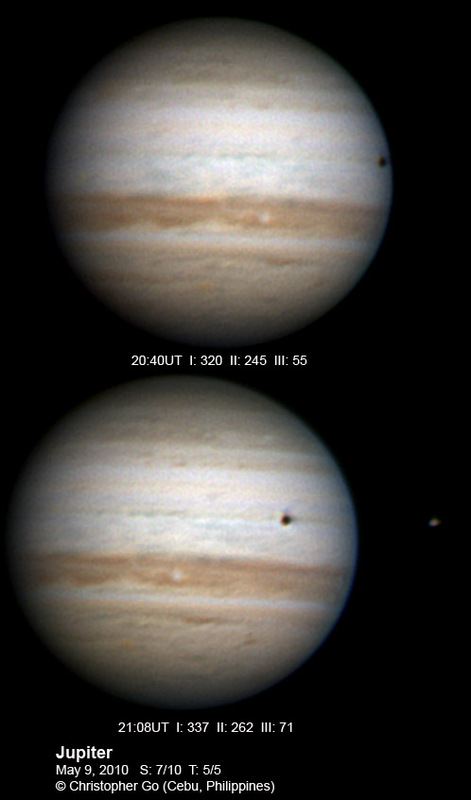 Io's shadow is transiting the SEBn. The NEB is very dark. Note the white spot on the mid-NEB. The NNTZ LRS can be seen as an orange spot. Finally got excellent seeing!! No clouds and a good easterly wind makes good seeing!! The GRS is very prominent! Note that the halo around the GRS is bright especially the northern part of the halo. The SEB has a very slight hint of color but it is basically fully faded! The EZ looks active again. Note the dark oval on the NEB and the very bright white oval following it. The NEB is very red. Note the white patches north of the NEB. Seeing still unstable this morning. I was only able to get one good shot because of clouds. The GRS looks lonely without the SEB. The dark cyclone following the GRS seem to be breaking up. Oval BA is rising on the right. The NEB is very dark with some hint of rifts. Note the bright outbreak setting on the left of NEBn. Note the dark features on the NTB. Seeing was okay this morning. 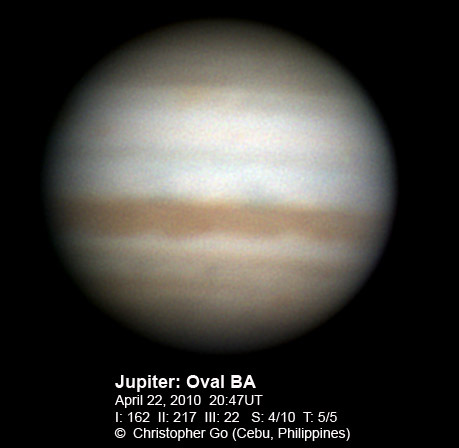 Jupiter is still shimmering because of it's low altitude. 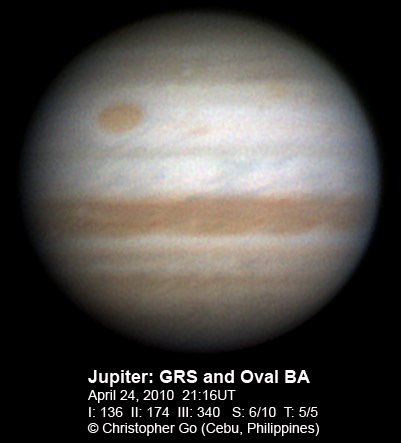 The GRS and Oval BA can be seen in this image. Oval BA's red ring is compressed! Note the two white ovals following BA. The GRS is very prominent with the faded SEB. The two dark cyclones following the GRS are very prominent now. The NEB is very dark! While the EZ is very quiet. Seeing was better this morning. 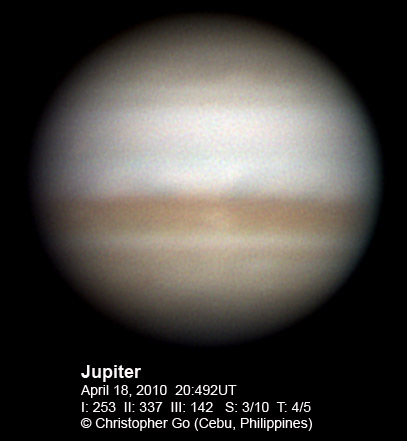 Jupiter was around 31 degrees above the horizon. 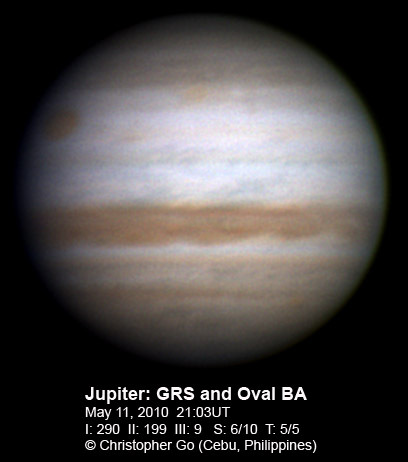 Both the GRS and Oval BA can be seen in this image. Both have the same color. The GRS is very prominent because of the faded SEB. Note the dark cyclonic oval following the GRS. Still no sign of the SEB revival. The NEB is very dark and broad while the EZ is very quiet. The Red Oval BA can be seen just past the CM. The SEB is faint with some red ovals in it. The NEB is still very dark. The NNTZ LRS can be seen rising. Seeing was horrible. 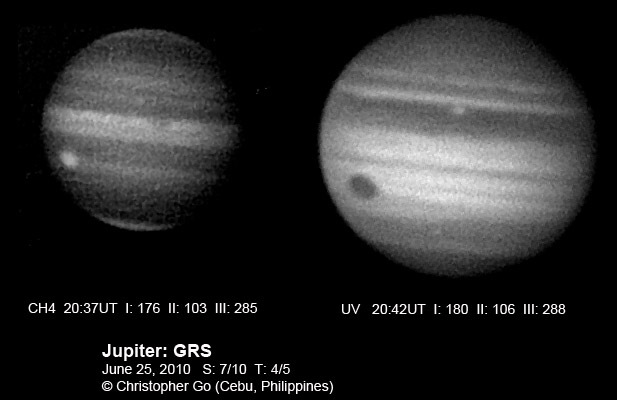 Jupiter was only 19 degrees. SEB is still very faint. The NEB is broad and dark. My first image this season! 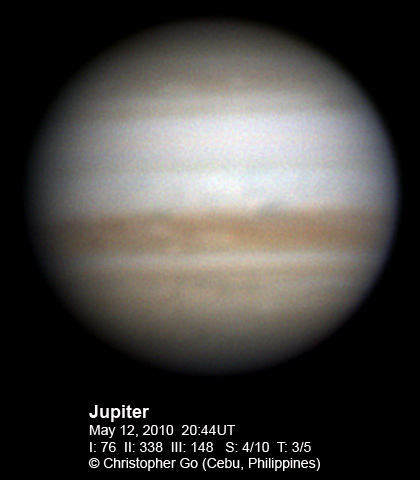 Seeing wasn't great because Jupiter was only 23 degrees above the horizon. I took this image less than 5 minutes before sun rise. Oval BA is very red! It is now moving closer towards the GRS! The SEB is basically gone! Only a dark remnant is at the SEBn and a thin red line on the SEBs. The NEB is very dark and wide! Note the dark red feature on the NTB. The NNTZ LRS can be seen in this image.